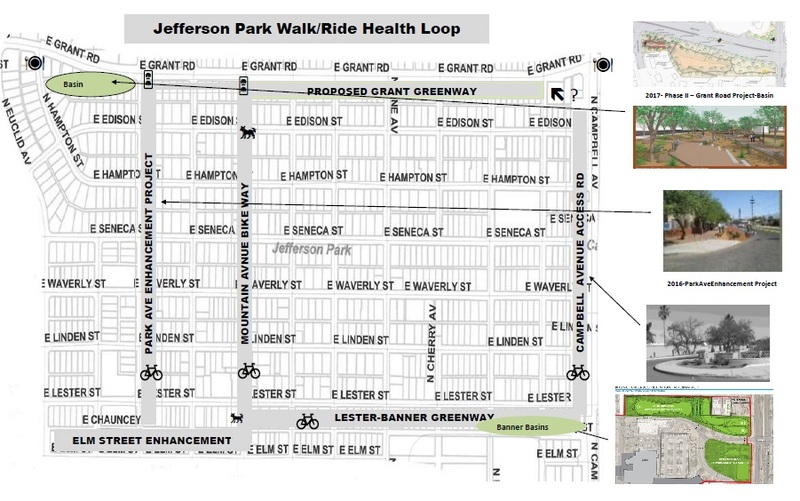 Jefferson Park is designing a neighborhood walk! Parts of the future loop already exist or are on the planning stages. Mountain Avenue is a matured walk/bikeway - the second most traveled bikeway in Tucson. Park Ave will begin its face lift in the summer of 2015 from a two lane street to one enhanced with pedestrian pathways and bike ways with added vegetation. Campbell Avenue on the east boundary is a model of bike friendly and pedestrian sidewalks and extends from Lester to Grant. moves to Lester in Jefferson Park. Elm Street is formally identified on the Pima County Regional Trails System Master Plan (August, 2010) as an “Enhanced Corridor”. The Master Plan defines enhanced corridors as routes that, “generally follow existing local or collector streets that carry a relatively low volume of automobile traffic”. The Elm Street Enhanced Corridor is nearly eight miles in total length, extending from Fairview Avenue on the west to Wilmot Road on the east. The Corridor enters the neighborhood at the intersection of Campbell Avenue and Elm Street. Elm Street Enhanced Corridor can best be implemented by facilitating bicycle/pedestrian connectivity to the north-south Mountain Avenue Corridor. Jefferson Park is bounded on the north by Grant Road. Phase 2 of the Grant Road Improvement Project ,GRIP, addresses the negotiations with the neighborhood for closing the "loop"
Campbell Avenue is the eastern boundary of the Jefferson Park Neighborhood. 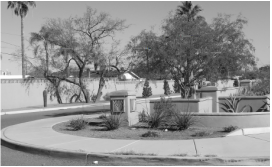 In 2000, Campbell was widened and the west side received an access road with two separate entrances. Two sets of walls mitigate the effect of the four lane roadway. The higher wall protects the neighborhood and the lower wall protects walkers and riders. Ample green space and native plantings complete an aesthetically pleasant experience. This very mature bike/walkway is the second most traveled bikeway in Tucson. It carries many University students and is a conduit for bus transportation from various student housing sites. The Park Avenue Project will begin the summer of 2015. Native plantings, decomposed granite walkways and bike paths will be added. Additionally, bike safety mitigation will be present at the intersection of Park and Grant.